Ah, Halloween! That special time of year when monsters and ballerinas set aside their differences to walk hand in hand around the neighborhood in search of coma-inducing, sugary treats. I was going to write a long, well-formed essay on the strangeness of this fall ritual that seems to have taken on a life of it own. For instance, why is it called a holiday? Isn't that supposed to mean holy day? Perhaps in the days of the ancient Celts, Halloween's ancestor feast day was considered holy. But I find it hard to put the concept of holy and begging for candy in hob goblin clothing in the same sentence. Particularly because I've got a bit of a sugar headache from eating a good portion of leftover candy, I think an essay is out of the question. I'll just write a few bullets and let it go with that. I don't think I've ever been a real fan of Halloween, either as a kid, or as an adult. I think one has to be really secure in one's own skin before she can throw herself into becoming someone/thing else even for one night. Self assurance has never been one of my strong suits. Like other contemporary merchandising extravaganzas, Halloween has taken on a money guzzling life of its own. Gone are the days when little kids could enjoy a relatively mild day of dress-up and popcorn balls. Today's child is hit with a marketing blitz of mammoth proportions. Candy, costumes, pumpkins, neon colored lightsticks, yard decorations, spooky-screeching cd's. You name it, and it's right there on the shelf next to the pre-lit Christmas trees. I heard on tonight's news that a dentist was offering to buy back the local children's left-over candy (Read: Raisinnetts and Smartees). For a dollar a pound, kids will get rid of the candy they won't eat and can't trade to their younger siblings. On top of that the dentist is throwing in a super dooper toothbrush with lights that flash for two minutes at a time. Not all that coincidentally, two minutes happens to be the amount of time that is required to get that piece of Bit-o-Honey unstuck from your back molars. Interestingly, after the this enterprising dentist buys all this candy, he is then going to package it up and send it to the soldiers in Iraq. Call me a pessimist, but the last time I looked, Iraq was in the part of the world that is considered by many to be a desert. It's hot. It's sandy. It is NOT the kind of place where chocolate delights like Snickers and Three Muskateers bars are going to keep very well. I see a big chocolatty mess happening. And, I could be wrong, but do we really want to add rotten teeth to the list of infirmities those young men and women are coming home with? Maybe the dentist is going to send some of those toothbrushes along with the candy. Speaking of candy. If you haven't already read the nutritional (ha!) label on your favorite Halloween treat, STOP! I made the mistake of doing this after devouring the second bag of candy corn that was brought into the house. How can something that consists mainly of: sugar, and corn syrup, and contains less than 2% of the following: cocoa, salt, honey, confectioner’s glaze, partially hydrogenated cottonseed, palm kernel, and/or soybean oil (adds a dietarily insignificnt amount of fat) artificial flavor, gelatin, dextrose, soy bean lecithin, titanium dioxide color, yellow 6, yellow 6 Lake, red 40 lake, red 3, yellow 5, blue 1, and blue 2 lake taste so good? According to the package, Brach's has been selling autumn mix and making fall more fun for over 50 years. But here's the best part, America’s #1 Autumn Mix, is made with real honey! That's got to mean it's good for you! Well, there you have it, my take on Halloween. I've got to close this post and get to bed. I'm hoping that my night's sleep will be filled with visions of things to write about for the next month, instead of the blood dripping scary guy that came to my door tonight. Tomorrow, November 1st, marks the beginning of Nablopomo (National Blog Posting Month) and I'm already feeling a little performance anxiety. "Mothers, more commonly known as "Mom,"
At about this time five years ago, I was standing with the rest of my family at my mother's bedside. She was dying. We all knew it, yet weren't quite sure how to let her go. The hospital personnel did what they could to ease our decision. A priest prayerfully guided our thought processes. Only one nurse was a little crabby. Maybe not so much crabby as matter-of-fact. The patient on the respirator on the bed in the cubicle was just that - another patient -not her mother. Still it's hard, even after this much time, not to be resentful. Mom was basically gone to us earlier in the afternoon. What we were waiting for was the process of her body shutting down. What the doctors told us could be days, mercifully took only hours. To say I still miss her, is no big surprise. It doesn't hurt as much as it did in the beginning, but the space that the little lady who was my mother filled in our lives still resembles a heart-sized sink hole. Knowing I wanted to write something about her, I've been thinking about it for a few days. Words are my way of expressing my emotions, yet I haven't been able to come up with the words to say exactly what it is I miss. Imagine the Beaver (of Leave it to Beaver fame) coming home from school, swinging open the door, tossing his school bag on the table and yelling loud enough to be heard at the back of the house, "Hey mom, I'm home," just like he did every day. On this particular day, however, after the door slams shut, Beaver hears only the sounds of silence. The he remembers, June is no longer there. There is no aroma of fresh baked cookies. The TV is not tuned into his mother's favorite soap opera. There is no laundry neatly folded and stacked on the end of his bed. There is no one to temper his father's moods. Beaver knows he is home. He looks takes in the familiar surroundings feeling a mixture of comfort and dread. He feels her presence in each room. His eyes rest on the things that belonged to her - a bottle of Lubriderm, a coffee cup, the afghan she made, the books she read - yet the sound of her voice welcoming him home is a distant memory. She is no longer around to ask about his day; she is no longer there to take for granted. Beaver has learned to live without these things. What people told him has proved to be true. Wounds heal. Memories bridge the gap. He learns to lean on other family members and friends. Beaver's life has moved ahead. It's his heart that remains beside her bed. I can't speak for the rest of my family. I can only say how it is for me. A lot has happened in five years. Even though it felt like it might at the time, the world did not stop turning; those of us left behind have forged a way of life without our guiding star. We get a little of course now and then but the pull to magnetic north (a mother's love?) keeps us going. I was in a craft store the other day, looking for a How-to-Crochet book. There were two other women searching through the same stack of books. I overheard one say to the other, "you know if mom was here we wouldn't have to be doing this. She could teach us." My heart leapt from my chest to my throat. My eyes filled with tears. I knew exactly what she meant. Many were the times I sat by mom's side as she tried to teach me some knew skill. But she's not here now, and like those ladies in the yarn aisle, I'll learn to manage on my own. That doesn't mean I'll like it. I'll close this post with a request. If your mom is still alive, tell her you love her. If your mother, like mine, has already gone to that heavenly place where kids pick up after themselves and eat their brussel sprouts without being told, and flush the toilet and remember to say please, then write me and tell me, if you can, what you remember best about her. *Taken from a Mother's Day card given to me by Wendy. Does anyone but me remember the Hanna Barbera cartoon character Quick Draw McGraw and his alter ego, El Kabong? Dressed in Zorro-esque fashion, the masked McGraw would foil his foes with a surprise attack of his trusted acoustic guitar, aka a "kabonger." Althought Kabong often destroyed his guitar in the process, he usually got his man. Lately I've felt like I've been "kabonged." Not by a guitar weilding cartoon horse/man. I haven't seen any of those, which I think is probably a pretty good thing. No, I think my kabonger is more the kind of message that keeps coming from places you don't expect - the universe? God? a magic 8 ball? Everywhere I turn, a mysterious yet compelling messenger tells me "Write." "Anything, just write," comes the reply. Is it just me or is the way other writers got started? In an article I copied from somewhere (The Oprah magaizne I think, but couldn't swear to), Walter Mosely writes, "the first thing you have to know about writing is that it is something you must do every day. "* One of his reasons for this exercise is "connection with your unconscious mind." Mosely also says that he thinks "writing is primarily an unconscious activity." Hmmm, how can I be sitting here thinking of words to write if, in fact ,what I want to write is buried somewhere in my uncounscious mind. That in itself is kind of scary. I suspect my unconscious mind looks a lot like the junk closet where one puts the things one doesn't want to lose. You know those items that they'll most likely never use again, but might someday. I stored a bowling ball long after my bowling days were over, and 8-track tapes right up until the day I got my first CD player. Show me a mother's catch-all closet and I'll show you the potty chair she can't bear to get rid of even though her children's children have long since given up cotton training pants and reading Once Upon a Potty. See how my mind works, I want to write about writing and I end up lost in memories. I'm not sure my unconscious mind should be my writing muse. After reading an essay and writing an email to the author about wanting to be a writer, I got this response: "Write every day, no matter what." No matter what? What about the laundry? And then to top it all off, my blog mentor, antijen, commented on one of my posts,"If you're really feeling guilty about your inconsistent entries, which you shouldn't, you could consider challenging yourself this November to National Blog Posting Month." All good advice. I'm not denying it. But I have to say, I'm thinking what I really do not need in my life is another challenge, or another reason to spend time in front of my computer. As I sit here, I think I feel little ivy-like tendrils growing from my bottom to the couch. There is an argument for exercise of the mind as well as the body, but I haven't yet learned how to do both at the same time. I've checked out the National Blog Posting thing. Here's what the website said: "You get yourself a blog, if you don't have one already -- and don't mind me if I'm stupefied at the idea that there's someone left in the English speaking world without their own blog. Then you look at the calendar, and when the whole world goes, "Oh, I can't believe they're already playing Christmas music in the warden's office!" you'll know it's November and that is the month in which you post something to your blog every day, in accordance with the National Blog Posting Month challenge!" Apparently the enticement to do all this posting is the possibility of winning random prize drawings. I thought about it, and yeh, prizes sound good. I've got to be honest, though. I'm wondering if I belong to some huge blog writer's club, will some un-biased (as in other than my daughter, sister, or sweetie) reader acknowledge that there is a certain something in the way that I put words together that makes them smile? Is writing all about my ego? I think it might be. But I haven't yet figured out what the point of writing is if the writer doesn't have someone read his words and say something along the lines of, "Damn, that was good!" I might be a bit narcissitic to think that anyone would want to read what I have to say, but that is the nature of the beast, isn't it? Talk/listen, write/read. One's not much fun without the other. I don't know if I have anything good to say. But I do know that I have an bunch of words in me that want to come out. Blogging is as good an avenue as any to clear my mind of the clutter. So, I'm going to do it. I'm going to put Random Thoughts by Merry Me on NaBloMo.ning.com. Just so you know, I've also bought some yarn, a crochet how-to book, and material for a quilt. With 24 hours in each day, if I don't sleep or eat, I may get all my projects done by next year. Today was the kind of day one has to have every now and then. A stay-in-bed-and-read-all-day day. It's been a long time since I've read a thriller that really captured my attention. Usually I read a page or two, fall asleep then wake up to turn the light out when the book falls out of my hands and makes a thump on the floor when it lands. The Poet, by Michael Connley kept me reading til the toothpicks fell out of my eyelids. I just could't make myself come fully awake this morning. Mainly because I slept late this morning, mainly because I was up so late reading last night. Also . I'd peek every now and then at the clock or the cat, then roll over and go back to sleep. Once I heard the walker bump down the hallway, I knew I had to get moving. I drug myself out of bed, did what I had to do, then worked my back to the bedroom. The cats were a little startled to see me back so soon. Neither was very excited about relinquishing the spot they'd already made warm and cozy. Being the human in the relationship, I climbed over the lazing felines, I snuggled under the covers and and picked up reading where I left off ... on the trail of a creepy, villianous killer. I got up occasionally to fix another meal or two, but mostly I turned the pages and kept reading. Talk about luxury! Just as I was nodding off my sister popped in to ask if I wanted to go on an adventure with her. An adventure was about the only thing for which I'd put the book. I was beginning to think there might be two killers! Yikes! Jean's adventure turned out to be a drive to the Northside of town. Her car that was stolen a few months ago had just found deep in the piney woods. Her excitement was palpable. Watching her react to finding so many of the things she'd thought were lost for good was just plain fun. It was worth the ride. Once she began doing the Christian version of the Happy Dance - jumping up and down, singing "Praise-Jee-zuz!" and "Thank you God!" then jumping up and down some more - Jimmie, of Jimmie's wrecker service, his wife and I just stood back and watched. I've got to admit, her enthusiasm was kind of catching. Poor Jimmy had probably never had anyone in his impound yard who was so excited about seeing a car that had been stuck up to its sidewalls in bugs and muck. I'm pretty sure, though, I saw Jimmie's wife say send up her own prayer of thanksgiving when Jean discovered the Bible under the seat. The cover was wet and messy, but blessedly the insides were still in tact. Alls well that ends well. After we got home I made dinner, eeking out enough time to read a few more chapters. I could count the number of pages left, but couldn't figure out how the story was going to end. But end it did, leaving me uncertain if the killer, like Hannibal Lector, is still out there in mysteryland waiting to be recreated. It's been a good day. I feel totally decadent, a little bit sleepy and a little bit jazzed up. I think it's time to shut off the computer and push the cats off my side of the bed. Unless I want to dream about murder and mahem, I may just have to peruse a few of the catalogs piled up on the cocktail table. I think it is official. The Christmas season is upon us. I'm not talking about the religious version of the baby in the manger with a star shining brightly overhead and angels singing a delightful glor-or-or-ia. I'm referring to the merchandizing frenzy that often resembles a school of sharks going after a bucket of chum; customers fighting over the last few Tickle Me Elmos and the merchandisers who know how to stock the shelves with just the right number of the giggling muppets to keep harried moms from starting a riot. For the last couple of weeks, stores have been decking their aisles with tinsel and garlands. I've already seen the season's first Christmas trees up and decorated. I've passed by boxes of wrapping paper and greeting cards. But my real clue that the holidays are nearing is in the number of catalogs the postman puts through our mail slot every day. It's embarrassing. It's pointless. Most of all, it is a sad reminder of how times have changed. When I was a kid - one of five who whole-heartedly believed in the magic of Christmas - the season began with the delivery of one catalog. One precious book that had to be shared by the whole family. The Sears and Roebuck Wish Book. The delivery of the Wish Book was like receiving a personal invitation to the grand opening of Santa's Toy Shop. The cover was always glitzy with a wide-eyed child dressed in holiday finery looking with wonder at a Christmas tree bedecked with all the trimmings. We passed around the dream maker like it was the Holy Grail, while visions of gifts to come danced in heads. Mom would let each one of us pick out what we hoped Santa would bring. Although she was surely limited in what she could afford, I don't remember any limits put on our list making. We counted down the days til Christmas wishing and hoping. I don't know how my sisters did it but I was pretty methodical. I'd start at the beginning and scrutinize every page, giving each item a careful going over. I didn't spend a lot of time at the beginning of the book where the cute, yet practical, items were featured. Like the tangarine in the toe of our filled-to-the-brim Christmas stockings, it was a pretty sure bet that everyone would receive a new pair of flannel pj's. Nothing makes for a Christmas Kodak moment like little girls excitedly wiping the sleep out of their eyes, as they approach the gift-laden tree, clad in their matching jammies and slipper socks. After the presents were opened we'd don our new outfits for the official family photo. From my mom down to the youngest daughter, we would pose collectively, then individually, for the annual fight over who was going to smile or not. Since Dad was the official photographer, he was not required to wear velvet. Even without going back and looking through old photos, I'd bet he was sporting a new plaid shirt! There must have been stuff in the Wish Book that would have interested boys but none that made much of an impression on the Reynolds girls. Although I do remember the year Santa brought Jo a many-pieced erector set, complete with her own screw driver set and how my inner boy child was a tad envious. But not for long. In our house, baby dolls of every size that came with a variety of human attributes (Betsy Wetsy, Chatty Cathy, Saucy Walker) were what Christmas was all about. Since most of my opinions are based on gut-feeling rather than well-researached information, I shy away from political discussions. For example, qualified as Al Gore might be, I think the Nobel Peace Prize should have gone to the person who decided to put DVD players in the back seat of the family automobile. Children wearing individual sets of earphones, staring at a mutually-agreed upon movie can not be held responsible for "touching" each other. Traveling to Grandma's house has been miraculously turned into a tranquil outing. Ahhh, peace! In his defense, Mr. Gore has been preaching about the environment, global warming and the melting of the polar ice caps - all good causes. Am I the only one who thinks Al would be doing us all a greater service if he began to concentrate his efforts on the number of trees felled for catalog production? Last week I was looking forward to taking a road trip to see the Smokey Mountains decked out in their beautiful fall foliage. Circumstances beyond my control caused a postponement, perhaps a cancellation of the trip altogether. Nothing like a little angina (not mine, my Dad's) to let the air out of one's tires - metaphorically speaking of course! All's well that ends well, however. We got Dad home from the hospital and settled back into our daily routine after only three days. Still I needed a change of scenery. On a whim, Jack and I left my sister, Jean in charge of the homefront while we headed north on Highway A1A. We discovered the old beach road ends rather abruptly in a stand of sea grass. This is probably because Fernandina calls itself an island. Feeling wild and carefree we decided to turn the corner and follow where the road led us. A drive along the Florida coast soon turned into junket through southeast Georgia. The temperatures had dropped to a pleasant 70-something; there was nothing but blue skies as far as the eye could see. I could feel the tension seeping from my shoulders as the odometer clicked off the miles. Here are some of the highlights of our "unplanned" (see previous post) outing. 1. W e stopped for a potty call at a place called El Cheao gas. As it turned out, this truck stop/gas station/jiffy mart was anything but cheap when it came to its accoutraments. It was easily one of the largest and cleanest I've ever seen. The bathroom was most impressive so I decided to pull out my trusty sidekick and take a few pictures. 2. You gotta love a dog that will just sit and wait in an open topped jeep for his master to come back. 4. Not fa r apart on this Georgia highway we passed Carolyn's Country Cooking restaurant and a lone garbage-eating turkey buzzard. The once proud eating emporium (you could tell by the size of the lettering on the wall) was deserted and no longer serving up any food, yet it was a photo opportunity not to be missed. As you may recall from previous posts my inner child, Carolyn, is not shy ab out letting her needs be known. At seeing her name written on the side of a building she got quite excited. I was glad to see there was no phone number attached! The turkey buzzard enjoying an afternoon snack from an up-turned garbage was also a Kodak moment I couldn't resist. Unfortunately as soon as Jack whipped another U-y and I hopped out to take the picture for Wendy's collection of black bird photos, this particular bird got a little camera shy. It was kind of funny to see him walk/run/buzzard hop away. I know there is a big difference between a buzzard and a crow, but they are both black! Enjoy Wendy! 5. We soon found ourselves on Jekyll Island, not far from Brunswick. There were festivals [the Birding and Nature Festival and the Brunswick Rockin' Stewbilee, respectfully] taking place on in both places. Somehow we managed to miss them both. Since I believe one of my manitoos is the slow but steady turtle, it was fun to stroll through the Georgia Sea Turtle Center and learn more about this languid yet enduring species. With all the impediments in their way, i.e. turtle eating critters, beach trash, humans, pollution, and plastic garbage bags, to name just a few, it's actually kind of amazing that any of the cute little baby sea turtles ever grow up to be big - BIG - sea turtles. What I find even more amazing is that these creatures swim circles around the Atlantic Ocean, struggling to survive for years on end. They don't come back to Georgia to reproduce 'til they are almost 60 years old. No wonder those mama turtles crawl so slowly up the beach. They are worn out! 6. We hurried through the Turtle Center because we wanted to make it to the Stewbilee. We were a little surprised, and a lot disappointed, when we got to the rather sleepy looking town of Brunswick and found it closed up tight. Either they ran of stew or just practice the Hispanic tradition of afternoon napping. There were very few people in sight and narry a stew stand. At least none that we could find. 7. However, we did come upon a sign that pointed us to another local attraction - the Lover's Oak. Obviously love was in the air for us because Jack agreed when I asked if we could have our picture taken by the tree. Even though there were arrows pointing to this behemoth tree, at first we managed to miss both the signs and the tree. But we did see all kinds of magnificent Victorian style houses. Houses so big it's hard to know how the owners could afford both the mortgage and the utility bills; especially considering we had yet to see too much of an active business life in this town. Driving down some of the streets that had been there since Captain Mark Carr settled the Brunswick plantation in the 18th century, we were transported to a different time and place. Oh to sit on a rocker on one of those wrap around porches and listen to the stories the creaky old places could tell. As with most good things, our day was over before we were ready to see it end. We drove home quietly, each of us lost in our own thoughts. Driving to Georgia was not quite the same as driving to Tennessee. There were no red and yellow leaves to see, even on the Lover's Oak. But seeing the pink and orange wildflowers, the puffy white clouds, the greenish brown turtles and the blue of my sweetie's eyes was like getting a sneak peak into God's box of Crayolas. It was good to get away and it was good to be together. Over five hundred years ago Christopher Columbus bumped up against the first spit of land he and his fellow seafaring explorers had seen in several months. I can only imagine that they experienced something of an elated "Woohoo! We did it!" feeling, combined with a dizzying snippet of "what now?" I also suspect there were a few sailors that told old Chris they weren't stepping foot back on those boats until some of the luscious looking tropical treats were added to the menu. Call me crazy, but I think that turning the anniversary of the day that proved to be the beginning of the end for the natives who had been living in the old world for thousands of years into a holiday is a little strange. Don't get me wrong, I think Columbus and the boys did an amazing thing. No doubt saying goodbye to friends and family for a voyage into the unknown must have been down right scary, even for the ancestors of what we know today as macho Hispanic men. Nevertheless, I think it's kind of weird to celebrate the crowning achievement of this intrepid sailor and his men simply by extending the first weekend in October by one day. Can't you just hear Chris saying to his men, "Holiday? You want a holiday? We've got countries to plunder and people to conquer. Let's get back to work men, and figure out what we're going to call this brave new world." Unless one lives in Columbus, Ohio, Columbus, Indiana, or Columbus, Georgia, I doubt if many Americans (people who live in the USA) even stop to think about Christopher Columbus and how his bluejacket escapades changed the world. Ocean travel is no big deal today, but back in 1492, Chris must have been the laughing stock of his neighborhood. With the benefit of hindsight and history books, we now know that his ideas weren't so far fetched. We also know the world is round and Eric the Red discovered North America before Columbus was even a glint in his daddy's eye. However, back then the people of Spain, Italy and Portugal had never heard of the Vikings. In fact, their knowledge of other people in the world was probably as limited as their knowledge of the its geography. You've got to give it to Chris. He must have been some kind of fast talker to get Ferdiand and Isabella to dip into the royal Spanish coffers and give him a big stack of pesos because there was a very real chance they'd never see him again or any return on their investment. Even though the seafarers didn't know exactly where they were going, their ultimate destination was the Orient. So I ask you, when they landed in the Bahamas (a far cry from China), the only dry land they'd seen in a l-o-n-g time, what made them declare it was a new world? Why didn't they think they had made it to where they were headed? And let's say they had made it to their desired destination, I'm not quite sure why Chris thought he had the right to claim the island(s) for the King of Spain. Wouldn't that be kind of like me heading out for Georgia, ending up in Alabama and calling it Maryland. What's up with that? Also, I have to ask if Columbus truly thought he had made it to Japan, why did he call the natives Indians and not Japan-ians? That first group of Spaniards must have made a big impression on the people they met when they landed; metal helmets, body armor and long knives most likely impress by their very propinquity. The Nina, Pinta and Santa Maria, precursors to Carnival's fleet of cruiseliners that sail in and out of the Caribbean Islands, undoubtedly sent rumors flying across the ancient coconut telegraphs. I don't think it would be too farfetched to think those indigenous people also enchanted the explorers. Oh sure, Columbus made it back to Spain with a little bit of gold, some exotic food stuffs and a new world map, but he also took with him tobacco and syphilis. An even trade for the havoc the old world germs wreaked on the natives and ecology of the Americas? You decide. Maybe Columbus's discoveries were preordained. Maybe they were just plain good fortune. If it hadn't been Columbus, it would have been someone else. All that land sitting in between of two oceans was ripe for discovering. All those Renaissance men stretching their minds beyond the known limits. There was bound to be a collision of people and cultures. There aren't many new frontiers waiting to be uncovered anymore ... Antarctica, outer space, the bottom ocean. None of which sound real inhabitable to me. But there are still people who don't settle for the status quo; who push the envelope of mainstream thinking and travel to the beat of their own marching band. Perhaps along the way, one of them will discover a way to blend the old with the new in a peaceful, respectful way. When that happens, I think a parade would definitely be in order. In an attempt to replicate for Jenni James [antijen.blogspot.com]the same birthday blogs she composes for her nearest and dearest, Wendy and I have put our heads together and come up with a bunch of reasons we love Jenni. What we lack in number we more than make up for in a lovely little jaunt down memory lane - at least it was lovely for us. Remembering the Jenni Thomas of old is almost as good as calling the Jenni James of today a friend. We are the lucky ones. 1. My first meeting with Jenni was when she came to our house to buy a quilted vest I had made. It was denim with a big circle patchwork star on the back. As I recall, her mom had seen the vests at a craft show and wanted Jenni to be sure to get the one she liked best. Little Miss Thomas gave each vest a good going over and serious consideration before making her decision. At least that's the way I think it happened. Maybe she just grabbed. The end result was the same - they left with a vest and smiles on their faces, while I added a remarkable young lady to my list of special people. 2. Since I don't possess the same powers of recall of which Jenni has been gifted, I can't tell you much more about that first meeting. I do know that we lived in the same neighborhood, and we had the navy and public schools in common. 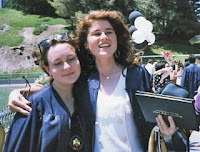 Jenni may not have been the kind of permanent school chum that others were, i.e. the kind that you could expect to stay for dinner; however, she was in the circle of friends all Ellingtons remember fondly. 3. Growing up, Jenni had the best swimming pool in the neighborhood. Black bottom! 5. Jenni is wicked smart as proven by the fact that she consistently aced her trial LSAT tests as well as the following. 7. Jenni and Wendy were partners for the egg drop back in high school and together chose to ignore the point of the assignment, which was to create the lightest contraption that would keep said egg in tact after it's dropped from a two story building. They went for a very light watermelon. Kudos to Jenni's Mom who let them do two practice watermelon drops from the Thomas roof. The final contraption involved stuffing the egg in a cotton-filled tupperware bowl and then stuffing that into the watermelon. They didn't win the egg drop, but were definitely the crowd favorite. 11. As precursor to her Birthday Blog Jenni made a memory jar for Wendy. I have always been impressed with her ability to remember the little details of things that happened even years ago. 12. Jenni participated in Wendy's "Send a Birthday card to my mom" campaign. In fact Jenni sent a long, several page letter, typed on construction paper. How cool is that?! Jenni is a prolific writer. If you get a letter in the mail or an e-mail, better sit down and start reading, because they have some girth! To be a jenni-letter-recipient is a wonderful, wonderful treat. 13. Jenni is a writer, a reader and a giver of books. Even though she doesn't even know Molly Jo or Gary Wichansky, she sent a monkey book to their baby shower. 14. Jenni comes from a family of animal lovers. The Thomas clan loves them some animals! 15. However, she's not really a spider fan, or used to not be back in the day. 16. Someone who does all the seal rescuing has got to have a gigantic heart. 17. Jenni is a cat lover extrordinaire. In fact she's like a cat guardian angel. If I ever come back as a non-human, I hope I come back as one of Jenni's cats. She believes in allowing her kitties the freedom to roam around town instead of being locked inside looking out, even when they disappear for a few days. When they come home she welcomes them with open arms and doesn't ask questions or fuss at them for their disappearance. She makes repeated trips to a veterinarian without regard for her checkbook. She cleans up cat feces with the greatest of ease. And best of all Jenni has a real problem with euthanasia. 19. By her own admission Jenni's family might be a tad eccentric, but she loves them anyway. She is able to look beyond her family's foibles and put the "fun" back in dysfunctional. 21. Jenni is not afraid to try exotic food combinations like Apple Jacks and Sauvignon Blanc or strawberry marguritas and Little Debbies. This might make her sound like some kind of alcoholic loser, but I think if she were ever lost on a desert island this unique ability to put together food groups would work in her favor. 22. Jenni is just plain gutsy. When a challenge presents itself (LSAT, writing a novel in a month, babysitting her nieces ) she picks up the gauntlet, and she throws herself into it body and soul. 24. Even though she has been known to accidentally poison her husband, she really, really loves him. You can just tell by the way she writes about him. And the way she's smiling on her wedding day. 25. Jenni is a pirate and viking lover. Well, really, who isn't?! 26. Jenni is faithful to her goth roots and still loves to be black-clad. 27. Speaking of her dark roots, back in the day Jenni's favorite movie was A Clockwork Orange. My favorite movie 'round this same time was Goonies. 28. Jenni is crafty. Need a paper mache cat or handmade scarf? She's your girl. 29. Jenni is a girl after my own heart. She likes to sleep in late, take naps and snuggle. I believe if Jenni is ever elected President she'll make sure that government offices don't start their day before 10am. 30. Jenni is a self-proclaimed cake lover, nevertheless she is the proud owner of a very fancy pie safe which will never hold a pie. Go figure! May flowers always line your path, and sunrise light your day. May songbirds serenade you, every step along the way. and may happiness fill your heart, each day your whole life through. Baby Bear: "I arise in the morning torn between a desire to improve the world and a desire to enjoy the world. This makes it hard to plan the day. " E.B. White. Ahhh, Oct ober. It's not just a month on the calendar. It's the harbinger of a change in seasons, football match-ups, apple festivals and fall foliage. Not to mention the beginning of the end of the year holiday season, that begins with Halloween and runs through Christmas. Unless, of course, you follow the merchandizing calendar which had pumpkin and scarecrow decorations for sale shortly after the 4th of July and will be featuring New Year's Eve noisemakers and Valentine cards in the same newpaper ads. The thing I like best about October is the difference in temperatures, albeit minimal when one lives in Florida. There's just something about the way the air feels and smells after the 1st of October. When Mother Nature gives up her coat of green for her multi-colored fall attire, it begins to smell different, earthier. The summer aroma of hot dogs and marshmellows roasting over a camp fire, gives way to the loamy, fructiferous (I didn't make that up) scent of red leaves, orange pumpkins, and yellow squash. It's a toss up for me which season I prefer - the fall of the year or its calendar opposite, springtime. Perhaps I don't have to choose, because it is not that one is better than the other. It's the disctinct change that the seasons herald in that I love. Those in-between times when it's neither not hot or cold, but somewhere in the middle; not one hue, but a riot of color. The times when I feel like Goldilocks discovering that everything is "just right." October, like May, is the time of year when my Smokey mountain DNA calls me home. I'm really not what you might call a nature girl, until I start thinking about the sun shining through the haze and the brightly colored mountain vistas. October temperatures make me want to trade my Birkenstock sandals for well-worn Hi-Tech hiking boots, and risk the ire of air conditioner gods by opening the bedroom window. Every cell in my body longs to stand on the top of Buck Bald and shout alleluias to the creator of such beauty. I come by these feelings naturally. It runs in my family (except the part about the open windows)!! Dad has been talking about seeing the leaves turn for 6 weeks. In fact, it is this same call of the wild that actually got Mr. "I'm-just-fine-where-I-am" to commit to a trip to his old hometown ... Newport, Tennessee. According to the Cocke County chamber of commerce, Newport is the "heartbeat of the smokies." I have never lived there - probably never will - yet it is the place that my inner Indian princess calls home. The place where I can walk in the moccasins of my father's father and know peace. The very idea of a day or a week in the mountains thrilled me to the bone. Woohoo! !Roadtrip!! Let's get in the car and go!! "Wait, a minute." "Slow down," said Papa Bear. "We have to have a plan." "Plan?" said Baby Bear. "What's a plan?" With an incredulous look that questioned the possibility that one of his offspring would consider taking a trip without fulfilling his Boy Scout/Naval officer/Engineer/father #1 rule - Be Prepared, Papa Bear responded, "You know, a plan: maps, lists, guide books, telephone numbers, hotel reservations, mileage tables, car maintenance schedule ... that kind of plan." "Oh," said Baby Bear, not sure what all the fuss was about. And so it went. As Dad made his plans, I danced at the back door like the dog waiting for her nightly treats. "Is it time yet? Can we go now?" I think there was a time in my life when I was more of a planner. But really I don't think I've ever had it in me to be too rigid. It really doesn't make much sense as I especially do not like the unexpected. Yet, when I get something in my head, I like to just get on with it, hoping that the pieces will fall together with few distractions. Remember the kitchen re-do? It was both the planning and the non-planning that ran me ragged. You'd think I would have learned my lesson. As it turns out, this best laid plan went awry when Papa Bear began to have chest pains. Be it heart attack or indigestion, pains in one's chest can not be planned for. As much as we miss the leaves and the mist, we all know that this October we will not get a whiff of mountain air. I'm pretty sure the mountains aren't going anywhere. And I'm pretty sure they will continue to call us home. The highways probably aren't going to change so our AAA Trip-Tik will still show us the way. I can buy some apples at the grocery store, probably a lot cheaper than at a mountain festival. They'll have a little sticker on them that reads, product of Chile, but they will taste the same. You see it's not the fruit, or the road, or the trees that are important. It's not the heartbeat of the Smokies that I care about today. For now it's that steady beep, beep, beep of the heart monitor that makes me smile. "Get well, Daddio, you've still got plans to make." There are a couple of blogs of which I am a faithful follower. When the authors don't post on a regular basis (my regular not their's)I fret. Then I fuss. Then I fume. I know it's strange. After all the beauty of having a blog, instead of say, a newspaper column, is that it's personal and one can write whenever one pleases. The true irony is, I seem to be an avid reader who looks forward to daily log entries but only post my own whenever the muse stikes. One would think I would have more understanding of my readers' bated breath. Wrong! Apparently I'm more self-consumed than that! For those fans who have not given up on me and still check this site on occasion, I do apologize. Sometimes the words flow freely. Sometimes they are nowhere to be found. Sometimes I get busy doing other things. Sadly, I've realized that my ability to multi-task has gone down the tube. Lately I've tried to remember how in the world I ever juggled more than one, possibly two(or 10), "life" balls at the same time. I know I did it, I just don't know how. Is this yet another symptom of menopause? When all else fails, I find I can blame my middle-aged failings on hormones. As if this is a universal excuse, other women my age nod their heads with an X-chromosome understanding. "Ohhhhhhh," they say with an empathetic nod of their heads. Like wooly mittens and a warm winter scarf, the drying up of ovaries and the mis-firing of brain synapses are a matched pair. I may not have been writing, but I certainly have not been resting on my stack of princess pillows eating bon bons. For the last few weeks, I traded my typing skills for triage and first aid. My sister had some pretty major surgery. It fell to the dog and me to see that she was properly nursed. I've spent a good part of the last 12 years as a caregiver, but truly, my job description was more about hand-wringing and pacing the floor than actual hands on wound care and drug distribution. Nursing has not always been strong suit. Years ago, when my daughter was pretty young, I fainted at the sight of her bloody mouth after some tooth extractions. The attending nurse made the mistake of asking me to stay with the poor kid until she awoke from the anesthesia. The next thing I knew I was coming to on a cot right next to Wendy with a washcloth on my head. There was also the time when my son, who was not yet a teenager but could swear like a well-seasoned sailor, took a nose dive over the handlebars of his bike. I was greeted at the front door by a good Samaritan and a kid I had trouble recognizing as my own because his face was so mangled. I was able to get him to the ER but as soon as the doctor mentioned stitches, I felt the room begin to spin. I'm embarrassed to admit it but I kissed my child goodbye and stood outside the curtain, shocked by the cursing but unable to get my head out from between my knees. So I gotta tell you, without sounding too braggadocious, I've impressed myself over the last few weeks. It is probably a good thing that I didn't know exactly what to expect. I thought I'd make some chicken soup and fluff some pillows, stuff like that. Imagine my surprise the first time I saw the drains coming from Jean's stomach. Drains as in tubes coming out of holes in her gut which deposited the contents of the wound into a plastic bulb; we're talking blood and goo. But I took a breath and emptied the thing like I was Florence Nightengale's long lost cousin. We made it through the first week with the help of a lot of prayers and drugs. Thinking back on it, I'm still not sure how we got Jean in and out of compression pants that were meant to hold everything together. It makes sense. Cram all the tubes, bandages and booboos into a pair of tight stretch pants, snap the velcro together and zip the zipper. Nothing's going anywhere, right? Except for the pants get covered in crusty gunk and need to be cleaned. Once removed they don't go back on very easily. Imagine if you will, trying to get into control top pantyhose, a size too small. Now imagine doing it with your gut stitched so that you can't stand up straight. Then put yourself in my shoes [it's all about me! Remember, Jean had drugs to ease her pain, I was on my own!] the official zipper upper. I cried every time poor Jean invoked the Lord's name and when it was all over, patient back in her chair and under the influence of powerful narcotics, I sat on the floor feeling a little woozy, wondering if I had it in me to do it all again. It was a few days before we noticed that the real nurse in the room was our black dog. Like the Darling's dog, Nana, from Peter Pan, Black Beauty was the self appointed patient sitter. She sat next to Jean's chair day in and day out. When we got up to walk down the hall, she followed not only looking concerned but making sure we were never in harm's way. When changed bandages, she came with us, making it clear to the cats that they were not welcome in the treatment room. I remember how she used to sit near my mom's chair, but I didn't realize then that she was on alert. I've noticed that she refuses to eat her breakfast until Dad is up and out of bed. But watching her keep watch over Jean gave me a whole new appreciation for (wo)man's best friend. Black Beauty is more than a sweet dog, she's faithful and loyal and deserves all the Milk Bones she can get. I'm really proud of her.